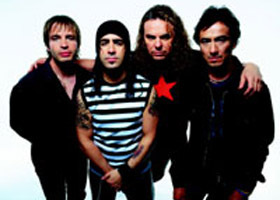 Maná is one of the most visible pop/rock bands on the scene today. Although they fall much closer to the pop end of the pop/rock spectrum, they are considered to have opened the doors for the Rock en Español movement worldwide. The band's history goes back to the mid-1970s when lead singer Fernando Olvera (Fher), Gustavo Orozco and bass player Juan Calleros along with his brothers Ulises and Abraham formed a garage band called "Green Hat Spies". The band started out singing in English, playing covers of hits by artist like Peter Frampton, Led Zeppelin and The Beatles. They changed the band's name to "Sombrero Verde" and in 1981 released a self-titled album and "A Ritmo de Rock" in 1983. Abraham and Gustavo, not seeing a future for the band, left in 1985. Word of advice: never ask these two for stock tips. Things began to change when dynamic drummer Alex Gonzalez was added in 1986. The band changed their name to Maná and released the once again self-titled "Mana" in 1988, which went gold. Their follow-up CD, "Falta Amor" didn't really take off until "Rayando El Sol" was released as a single two years after the album's release. The radio-friendly song became a big hit and the album went on to sell 750,000 copies. The members of the band often speak out about such issues as environmental protection and Chiapas. In 1995, the band started the non-profit foundation Selva Negra to fund several projects including protecting the Pacific Coastline, saving turtles threatened with extinction and providing food to needy communities.